Data insights are crucial if you want your rental business to succeed. Our Custom Reports provide you with access to more in-depth data and greater customizability – all from one place. You can identify connections between different data sets, and get specific with details important to your workflow. 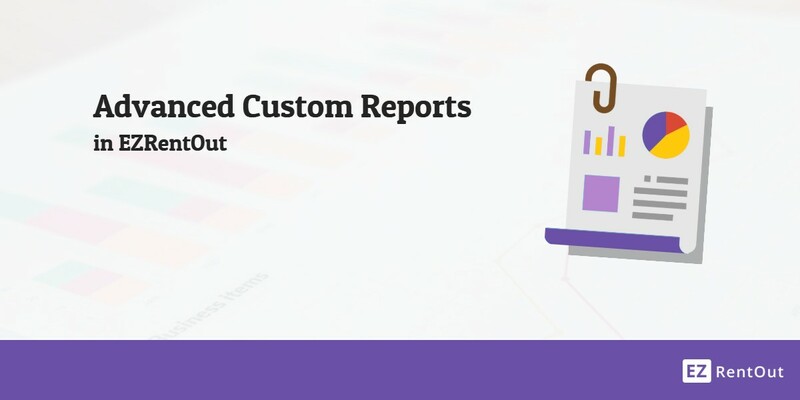 To get started, go to Reports → Custom Reports → Custom Report. You can also click on the ‘Create Report‘ button on the top right of the Reports page to be taken directly to the Custom Report page. Load Saved Report: Load a report you previously saved. Learn more. View Scheduled Report: View any reports you’ve scheduled within this category. Learn more. Export: Download this report as a CSV, or upload it to Dropbox directly from this page. Next, you can select one or more related modules. As implied by the name, these will change based on your initial selection. For example, choosing ‘Locations’ allows you to choose from related modules such as Items, Location History, Stock Requests, and Work Orders. For the purposes of our report, we’ve chosen ‘Items’ and ‘Locations’. The related modules you select here will open up additional choices to you in Step 2. Note: As you can see, a number of related modules (such as ‘Bundles’ and ‘Documents’) are greyed out in the image above. Some related modules can have multiple associations to a single entity. As an example, one order can be associated to multiple Items, Bundles, and Documents. When setting up a report, you cannot select more than one of these related modules. In the image above, we’ve already selected Items, which is why all the other multi-association modules have been greyed out. In the step above, we chose the primary module ‘Orders’, with the related modules ‘Items’ and ‘Locations’. In this step, we get to choose specific columns based on all 3 of these modules. We chose a few columns that would give us details about orders taken at specific locations. You can see that Location Name and Order Net Amount are two such columns we chose. We even added a Custom Field (‘Item Warranty’) that was created so we could get a sense of which rental items were protected with warranties. As always, the Custom Fields relating to each category appear at the very end of that category. You can now apply filters to your Custom Report by picking the relevant category, filling in the fields next to it, and clicking ‘Add Filter’. These filter options are also dependent on the primary and related modules you chose in Step 1. Note: You can’t run more than one of the same category of filter. For example, if the filter for the Order state is set to ‘Completed’, you will not be able to create an additional one set to ‘Reserved’. As you can see, you can completely customize your report using EZRentOut. Step 1 allows you to choose primary and related modules, so you can have a report focus. 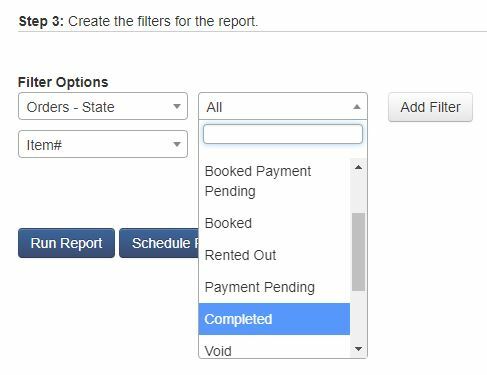 Step 2 then allows you to choose the specific columns that will make up your report, and Step 3 helps you apply filters to your data pool. Run Report: To generate your new Custom Report. Save Report: To save the report template for future use. Schedule Report: To send this report to specific people at set intervals. The Save Report button will only appear once you run the report. And with that, you’re done with the basics of Custom Reports in EZRentOut.